Unilateral military action against North Korea is not among the “options” which the United States should consider. Such a unilateral attack would violate the United Nations Charter, especially while the UN Security Council is addressing the matter. In an April 20 press statement, members of the Council “expressed their commitment to a peaceful, diplomatic and political solution.” The statement was issued by U.S. Amb. 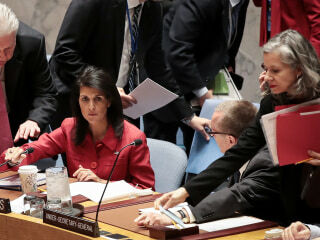 Nikki Haley as this month’s president of the Council. Further, there is no imminent armed attack by North Korea which could justify U.S. military action as a matter of self-defense under the Charter. The leaders of the DPRK are neither insane nor suicidal, and they know what the consequences would be if they began a war with the United States or South Korea. Diplomacy should be pursued vigorously, and realistically. The current U.S. position of refusing to negotiate unless North Korea agrees in advance to denuclearization – i.e., unless the other side agrees in advance to give up its main bargaining chip – is untenable. The DPRK leaders are motivated by a fear of U.S.-led forcible regime change, and threats and belligerent rhetoric can only make the situation worse. Instead, the North Korean regime should be offered the possibility of survival without nuclear weapons. The international agreement with Iran could offer a useful model. Recent suggestions by the Chinese Foreign Ministry, for example a freeze on North Korean nuclear and missile programs in exchange for a suspension of U.S./South Korean military exercises, should also be explored.